James “Great Neck” Richman and his wife, Elissa, have established an endowment fund to strengthen popular music studies at Case Western Reserve. Photo courtesy of James Richman. James “Great Neck” Richman (ADL ’72) is a business leader in the home textiles industry, a philanthropist, a Democratic activist and an advocate for humanities education For as long as he can remember, he has also been a fan of popular music. While earning a psychology degree at Case Western Reserve, Richman taught himself to play the guitar and became an avid concertgoer. He felt lucky to live in a city that attracted touring rock bands and solo artists, and he recalls their performances as landmark events of his youth: Joni Mitchell singing at La Cave, a celebrated coffeehouse a few blocks west of campus; Janis Joplin and her band, Big Brother and the Holding Company, taking the stage one summer night at Blossom Music Center; Jim Morrison and the Doors drawing a sellout crowd to the Allen Theatre, where tickets sold for $6 apiece, or $5 if purchased in advance. Back then, it never occurred to Richman that his musical interests could be anything but extracurricular. Listening to the radio or building a record collection were leisure-time activities, just like watching television or going to the movies. No professor ever encouraged him to study such things. In recent decades, however, scholars and educators have increasingly turned their attention to popular culture, and Richman has been delighted by one manifestation of this trend: Case Western Reserve’s commitment to fostering knowledge and appreciation of popular music. He points to the university’s history of collaboration with the Rock and Roll Hall of Fame and Museum, which opened in Cleveland in 1995, and to its Center for Popular Music Studies, directed since 2014 by Professor Daniel Goldmark. 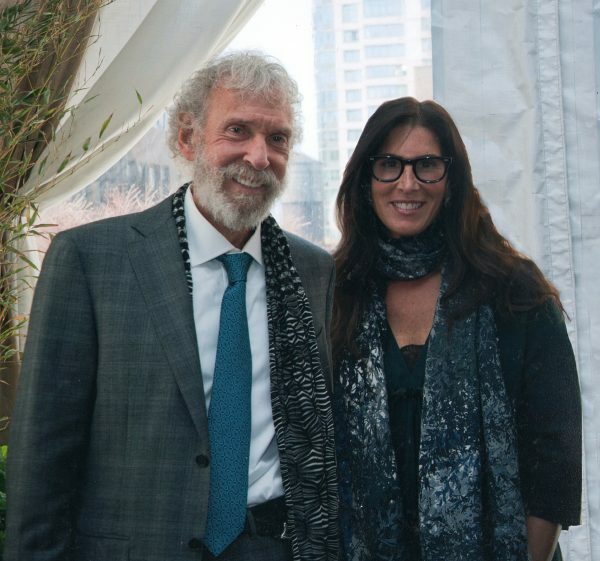 Now, to sustain and enhance the center’s efforts, Richman and his wife, Elissa, have pledged $1 million through the Richman Family Foundation of the Jewish Communal Fund to endow the Richman Fund for Popular Music Studies at CWRU. The field of study that the Richman Fund will support is as diverse and wide-ranging as popular music itself. It explores an immense variety of styles and genres from around the world. It recovers long-neglected eras in music history and generates new insights into familiar forms of expression. It seeks to understand how popular music contributes to, and is influenced by, social, cultural and political change. 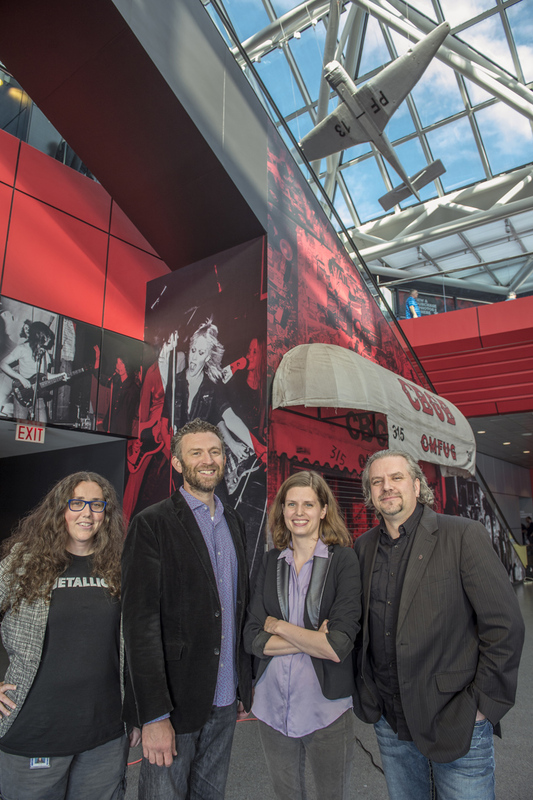 From left: The collaboration between Case Western Reserve and the Rock and Roll Hall of Fame and Museum has brought together doctoral student Mandy Smith, Professor Daniel Goldmark, doctoral student Leah Branstetter and Jason Hanley, the Rock Hall’s vice president of education and visitor engagement. Photo by Robert Muller. Tunes for ’Toons: Music and the Hollywood Cartoon (2005), he examined the careers of the composers who invented cartoon music, their techniques for matching sound to action and their appropriation of recognizable melodies from the classical repertoire. Since then, he has published an edition of “photoplay music”—piano scores written to accompany silent movies—and articles about the Tin Pan Alley composers who shaped American popular song in the early 20th century. In 2015, Goldmark received a fellowship from the American Council of Learned Societies to complete a book about stereotypical Jewish themes in popular song and in film music. Goldmark’s interests are complemented by those of faculty colleagues in CWRU’s music department. Professor Robert Walser, the center’s founding director, has published widely on rock, jazz and heavy metal. Professor Susan McClary, a pioneer in the field of feminist musicology, has written about popular music icons such as Bessie Smith, Madonna and k.d. lang. Assistant Professor Francesca Brittan, a scholar of 19th-century French music, is also a specialist in the blues and early rock and roll. Since its inception in 2012, the center has provided what Goldmark calls “a gathering space” for people devoted to exploring popular music. It brings visiting scholars to campus to give public lectures and present their research at the department’s weekly colloquia. It has sponsored conferences on such topics as queer popular music, Tin Pan Alley and the relationship between popular music and communities. During a 2014 conference on rock drumming, speakers illustrated points from their talks by playing on a drum kit beside the lectern. This summer, for the first time, the center held a symposium to help aspiring popular music scholars launch their careers. The event attracted 18 current and recent doctoral students from the United States and Canada, who met with five senior scholars and the director of a university press. “We spent three days talking about job applications, vetting articles, publishing—everything,” Goldmark says. “Everyone brought in a chapter or an article and received commentary on their work.” Some of the participants will return to the center next spring, when it hosts a meeting of the U.S. chapter of the International Association for the Study of Popular Music. Goldmark notes that the center benefits from the university’s long-standing partnership with the Rock Hall. Since 1996, the two institutions have jointly presented an annual Music Masters concert, paying tribute to a major figure in rock and roll history, such as 2016 honoree Johnny Cash. A daylong symposium precedes each concert, and Goldmark now organizes this event with Jason Hanley, the Rock Hall’s vice president of education and visitor engagement. Other aspects of the partnership, though less well known, also advance the center’s mission. For example, Goldmark administers a competitive fellowship for scholars and journalists hoping to do research at the Rock Hall’s Library and Archives, one of the world’s largest repositories of information about popular music. When Hanley invites historians or critics to speak at the museum, the center is often a co-sponsor, and Goldmark makes sure that graduate students from the music department get to meet them. The students sometimes pursue further opportunities with the Rock Hall, obtaining internships in the Library and Archives or finding jobs in programs that Hanley oversees. Goldmark notes that two current doctoral candidates are working full-time at the museum while they complete their dissertations: Leah Branstetter as digital education coordinator, and Mandy Smith as education programs manager. Richman says that strengthening the university’s ties with the Rock Hall was a key motivation for his gift. He is devoted to both institutions, serving as a Rock Hall trustee and as a member of the Visiting Committee of the College of Arts and Sciences, an advisory body to Dean Cyrus C. Taylor. Through the Richman Family Foundation, he and Elissa Richman previously endowed a scholarship for CWRU undergraduates majoring in the arts, humanities or social sciences, and they were among the first donors to the Milton and Tamar Maltz Performing Arts Center at The Temple–Tifereth Israel. The Richman Fund will also enable the center to forge new community partnerships. Over the past few months, Goldmark has initiated outreach efforts to schools, public libraries and arts organizations. “I want the center to have a conspicuous role in the city of Cleveland,” he explains.